Designed originally for canal narrow boats, where space is at a premium. The design emerged from playing around with a couple of cubes. Compact, but everything accessible, with the door facing up into the room for easy and safe operation. 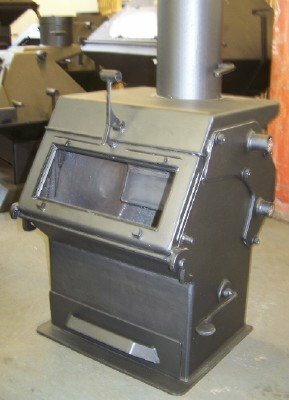 We'd reckoned that the Firebug and Hybrid models were about as simple as a stove could be, but this wee fellow shows that development never ends! 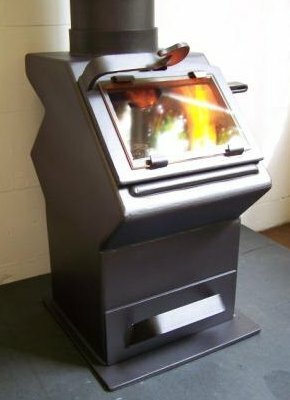 A genuine multi-fuel stove, built of the same heavy gauges we use for all our products. All steel construction, with no firebricks, rope seals, cast iron or ceramic parts to replace (except for the ceramic glass panel which simply slides out). Though at the smaller end of our product range, we can scale the Little Devil up to larger outputs, as required. With no need of firebricks, or sacrificial plates (the 8mm steel construction of the body will take temperatures up to 900 degrees without damage), there's no wasted space and virtually no maintenance. The outputs from this small stove require good insulation barriers e.g. a small brick wall and air gap behind. 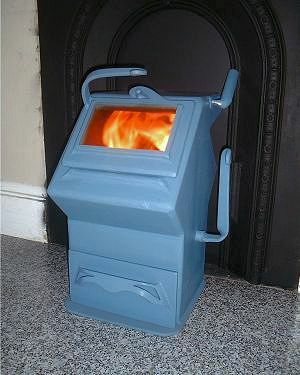 In confined spaces this will have the effect of storing heat outside the stove, for slow release into the room. 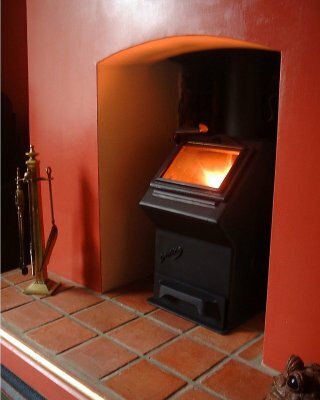 By off-setting the flue to one corner a small but effective hot plate is created - small, hot and very, very strong! ...devilishly clever! We have a Little Devil on display at the Wood Fuel Co-operative on the Heathhall Industrial Estate in Dumfries.